Meanwhile, Wigan manager Roberto Martinez defended the player, insisting the incident wasn’t deliberate. 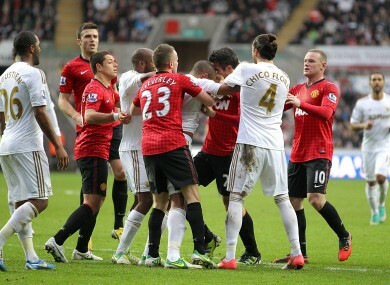 Players scuffle following the incident. SWANSEA DEFENDER ASHLEY Williams will not face a Football Association charge after Manchester United boss Alex Ferguson slammed the Wales star for kicking the ball into Robin van Persie’s head. Williams earned a stinging rebuke from Ferguson after Sunday’s 1-1 draw at the Liberty Stadium following the second half clash with van Persie. The United forward was lying prone on the turf following a foul when Williams kicked the ball into the back of the Dutchman’s head. Ferguson called on the Football Association to ban the Swansea centre-back, who was booked for the incident by referee Michael Oliver. “He (van Persie) could have been killed. Williams should be banned for a long time, Ferguson said. But it is believed the FA will not instigate disciplinary procedures against the 28-year-old, who denied malicious intent. Meanwhile, Williams was backed by Liverpool manager Brendan Rodgers, who was his boss at Swansea until the end of last season. “I think more has been made of it than what it actually was,” Rodgers said. “When you slow it down and look at it 20 times it does not look good for Ashley. “But I know the player well and it is just that split-second when you can see he is trying to clear the ball and unfortunately hits van Persie right on the back of his head. Wigan manager Roberto Martinez, who signed Williams for Swansea in 2008, admitted he could understand Ferguson’s reaction but did not believe the player acted out of malicious intent. “If you see one of your players with a bang on the back of the head it is really dangerous and it can have bad consequences. You can understand that,” Martinez said. “I signed Ashley Williams for Swansea and I know his character inside out. I can guarantee you without even looking at the incident that he is not a nasty footballer. Email “Williams won't face action after Van Persie row”. Feedback on “Williams won't face action after Van Persie row”.